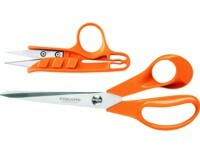 Premium fabric shears enhanced with ultra-sharp stainless steel blades to give a precise cut. Pivot design delivers a smooth cutting action. Ergonomic sculpting fits the movement of the hand. Protective sheath and try before buy packaging. Pack contains a pair of right-handed Classic 21cm scissors and the 12.5cm Quick Clips, suitable for unpicking stitches, trimming loose threads and seam allowance work. Right handed Pinking shears with precise zig-zag cutting action which prevents fraying, extended lower blade makes continuous cutting easier. Will cut through denim and woven materials.